For someone who only roasts chicken by the “low and slow” method followed by a “high and fast” step, trying this recipe from Jerusalem cookbook was quite a change: the pieces are blasted at 475F from start to finish. They advise to check the state of the skin after 30 minutes, and reduce the temperature slightly in case it’s darkening too fast. I was curious to see how our Supernova handled this challenge. but it cruised through the test! All pieces were nicely and homogeneously browned, the meat cooked to perfection. This is a super festive dish, perfect for entertaining. Jerusalem is one of the many cookbooks sitting on my bookshelf, but my inspiration to make this dish was a post from “Alexandra’s Kitchen” , a blog I love! You can read, and print her version of this recipe (which I followed) by jumping here. This is a simple but unique treatment of chicken pieces. A flavorful marinade is prepared with a mixture of arak (or ouzo), honey, orange, lemon juice and spices. You can use a whole chicken cut up, or go for chicken thighs as I did. The main flavor will be fennel and anise. Reading Alexandra’s blog as well as a few other sources in the net, it became clear that if you are not a fond of anise, better modify the recipe. It turns out that I absolutely despise ouzo (as well as Pastis, which brings a sad tale to my mind that shall be told some other time), so I used dry Vermouth instead. I also added only 1 teaspoon of fennel seed instead of 2 + 1/2 as originally called for. It turned out perfect for us. The clementine slices add a lot visually to the dish, but I did not care for their texture, even the ones that cooked protected from direct heat seemed a bit bitter and tough to me. They release a lot of juice and flavor into the sauce, so even if you don’t eat them in the end, no big deal. Additional comments: Probably one of the reasons this recipe works so well with intense heat from beginning to end, is the fact that the pieces are surrounded by quite a bit of liquid during roasting. The final texture is perfect, and the sauce tastes amazing, a powerful kick of fennel and the sweetness of clementines pairing with it. If you like anise flavor, go for Ouzo or, if you can find (and afford it), opt for the more authentic Arak. I know that most people associate recipes from Jerusalem exclusively with Ottolenghi, so I made a point of including Tamimi on the title of my post. I don’t think he gets the credit he deserves for being the co-author of such an amazing cookbook. This dish was our first dinner in the year 2014, and I thank Alexandra for the inspiration. It was a perfect meal to launch the New Year! I’d be afraid to cook a chicken at that high temperature but it looks beautiful so your new stove did a great job. Oh how wonderful! I had been looking for vegetarian salads from ‘Jerusalem’ just a moment ago [I LOVE the book, use it lots and do like that Sami Tamimi’s name has been added here!] and the tome was right next to me 🙂 ! I have not made this chicken recipe as yet, but love fennel and fennel seeds, so this will be prepared soonest, possibly using vermouth the way you have ~ I am not so keen on aniseedy flavours either. The cooking time suggested in the book is 45-55 mins at 200 C which actually does not sound unusual for me. Your photo looks more appetizing methinks tho’ the Ottolenghi one has more vegetables showing! What glorious fun comparing and a good ‘push’ to try the recipe oneself!! And am going back to ‘Alexandra’s Kitchen’ ~ it does look like a very interesting blog! Thanks for all!! Definitely go visit Alexandra’s site, it is wonderful! As it turns out, I despise ouzo also! It is going to make for a very interesting half Greek wedding in November… Anyways this looks amazing, as does anything from Jerusalem. Leave it to Ottolenghi and Tamimi to come up with a new method to roast the chicken pieces that actually WORKS. I have this cookbook and love it – Have not tried this recipe yet but I think I should – it looks delicious! 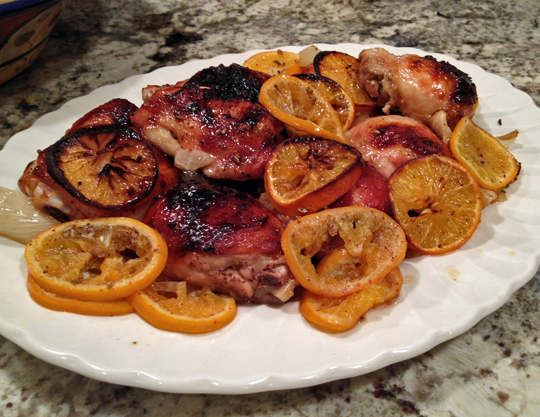 I love chicken and citrus pairings and have never done it this way. Looks awesome. Sally: This roasted chicken looks so amazing that I want to have it for breakfast. I cannot wait for lunch time! I too prefer to use the “high and fast” method for chicken roasts, even the ones which don’t have liquids at all. It keeps the chicken very moist and creates a tasty crust. Though the book is not about traditional recipes and it’s more of their own inspiration based on local foods and cooking techniques. In many recipes I’ve found they complicate the simple original ones to no end, but on the whole it is a good and inspiring book. Looks absolutely delicious, Sally! Supernova is working so well! Supernova still makes my heart sing…. love it. Just love it! We are thrilled with our new stove, that is for sure! I see a loaf of bread this weekend, or if I feel really brave… A CAKE! Can you imagine THAT? A cake! Looks beautiful, Sally! So happy you liked it. You are so nice to link to me — thank you! — but you should totally post the recipe in your post too if you want! Ps: did I mention last time how I covet your espresso machine? Is it amazing? Does it froth the milk well? Love the color too! I made this recipe a few months ago, toning down the anise/fennel notes by eliminating the bulbs and seeds but using the 6 1/2 T Pastis, (Which I also can’t abide as a beverage, but find invaluable when used sparingly, a few drops here and there, with certain ingredients) I used oranges, as I had them on hand. 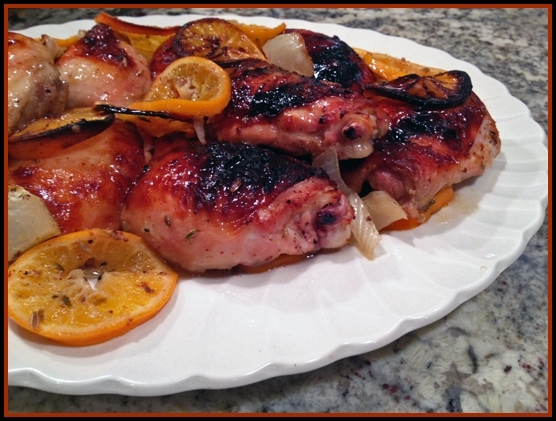 The fennel flavor was still strong, and the oranges were fought over….. chewy, savory candy! Your experience with fennel sounds scary – I have two friends who suffered loss of taste – one of them recovered after a little over a year. The other never did. It gives me shivers… very tough thing to go through, I am glad yours came back. I can understand very well your unwillingness to try fennel again… Forget it! 475, wow! That does seem high and yet the skin and chicken seemed to have turned out beautifully…supernova met the challenge! :). What a symphony of flavours going on in this dish Sally — sounds like a winner. The clementines do add great visuals — so pretty and give that succulent/juicy feeling — love the seared ones too. I thought I had left a comment but I can’t see one so I will have another go. Yum! I use this recipe very loosely as I don’t like cooked fruits with meat apart from lemons, and pastis reminds me of student travels and dubious drinking sessions long past, so I did it with fennel and lemons and loads of garlic and served it in the summer for a garden lunch and it was delightful and I love the fast and hot cooking method and the extravagant big pan of chicken, so juicy and fragrant. I received this cookbook for Christmas (yes, I was a good boy last year) and had already marked this dish to try, thanks for the advance review …… looks fabulous! I have absolutely no doubts that you were a good boy… The book just proves the point! I love anything from Ottolenghi! Looks delicious. what can I substitute the alcohol for? I think I would either leave it out or use maybe a little white grape juice (unsweetened) with a squirt of lemon juice to give it some acidity? But I do think that you can get by without it, there’s so much flavor in the other components! Sally, I have made this recipe several times and wondered why Yotam does not use the fennel fronds as the garnish instead of the parsley. I always use the fennel fronds to finish…they are beautiful…any clue? Today, I am making it using blood oranges, because I had them and for added color. OMG, with blood oranges.. yeah! wonderful color… no idea on his skipping of fennel fronds.. makes no sense, you are absolutely right!